PERFORMANCE DAYS – functional fabric fair is the place to be twice a year for the sourcing of high performance functional fabrics and accessories. With 297 exhibitors from 29 nations, PERFORMANCE DAYS shows the latest trends in fabric development for the functional textile industry. Being the only exhibition to link seasonal sourcing schedules (April/May and November), the fair offers visitors everything from textiles, to yarns, finishes and accessories. Besides manufacturers PERFORMANCE DAYS always features different partners offering services from color trends to certification systems. In addition to the unique guided tours (plus), workshops and expert talks by internationally respected orators, the PERFORMANCE FORUM is the core of the exhibition. The trend forum highlights the newest innovations and presents all of the current developments –with the PERFORMANCE (ECO) AWARD handed to the most innovative/sustainable product of the fair. The functional fabric fair attracts the major international manufacturers and nearly all of the well-known sportswear and active clothing brands as well as sportive fashion collection industry with its complete selection of high quality materials. Check out our Exhibitor List online for a complete overview of the exhibitors at the upcoming fair. Other than the bigger, often stressful trade fairs, PERFORMANCE DAYS is the ideal venue for manufacturers and decision makers in the functional fabrics industry to meet in a concentrated and focused atmosphere. Since 2008, the semi-annual event has become a must for designers, product, purchasing and material managers. PERFORMANCE DAYS, with its expertise and timing, offers manufacturers and buyers a calm workshop-like atmosphere and the tools to start their new collections. The exhibition is the place where tomorrow’s textile trends are on display today. At the PERFORMANCE FORUM, visitors can touch the latest fabrics, accessories, trends, and innovations in one of the most comprehensive and inspiring exhibits in the world. Organized in nine main categories, the PERFORMANCE FORUM TABLES cover the whole range of sports and outdoor applications with: Baselayer, Midlayer, Softshell, 2.5 & 3-Layer, 2-Layer, Highdensity & Lightweight, Shirt & Pants, Athleisure and Safety & Durability. The tenth table at the trend forum was introduced in November 2014 and serves to highlight the Jury’s Pick – with changing topics depending on the latest news in the industry. Besides the PERFORMANCE FORUM for fabrics, the PERFORMANCE FORUM WALL presents the latest innovations in high performance accessories. The participation is free for all exhibitors, which means the forum represents the broadest possible selection of state of the art textile innovations. With the brandnew "24/7 SOURCING" area on the website, the fair is available all around the year. 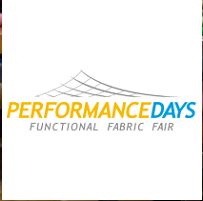 PERFORMANCE DAYS has digitalized its PERFORMANCE FORUM so that buyers can search not only for potential suppliers, but also for products in a database of 3.600 fabrics and accessories. Technical datasheets are available together with images, composition and information on the supplier - even samples can be requested directly!